Statistical procedures use ODS Graphics to create graphs as part of their output. ODS Graphics is described in detail in Chapter 21: Statistical Graphics Using ODS in SAS/STAT 13.2 User's Guide. Before you create graphs, ODS Graphics must be enabled (for example, with the ODS GRAPHICS ON statement). For more information about enabling and disabling ODS Graphics, see the section "Enabling and Disabling ODS Graphics" in that chapter. The overall appearance of graphs is controlled by ODS styles. Styles and other aspects of using ODS Graphics are discussed in the section "A Primer on ODS Statistical Graphics" in that chapter. You can obtain most plots relevant to the specified model by default. For finer control of the graphics, you can use the PLOTS= option in the PROC ARIMA statement. The following example is a simple illustration of how to use the PLOTS= option. The series in this example, the monthly airline passenger series, is also discussed later, in Example 7.2. The following statements specify an ARIMA(0,1,1) (0,1,1) model without a mean term to the logarithms of the airline passengers series, xlog. Notice the use of the global plot option ONLY in the PLOTS= option of the PROC ARIMA statement. It suppresses the production of default graphics and produces only the plots specified by the subsequent RESIDUAL and FORECAST plot options. 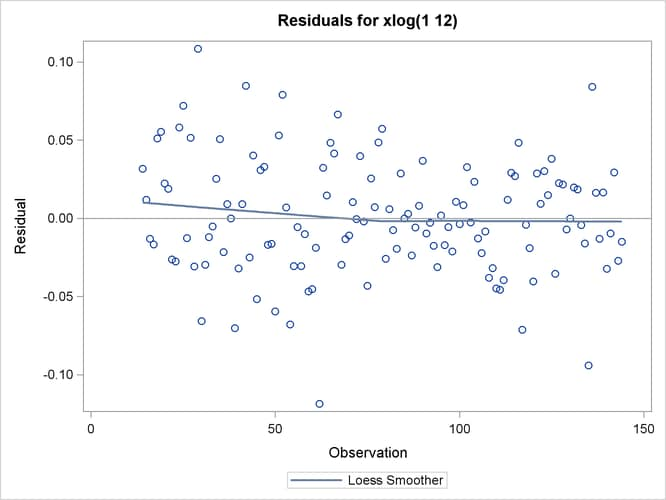 The RESIDUAL(SMOOTH) plot specification produces a time series plot of residuals that has an overlaid loess fit; see Figure 7.21. 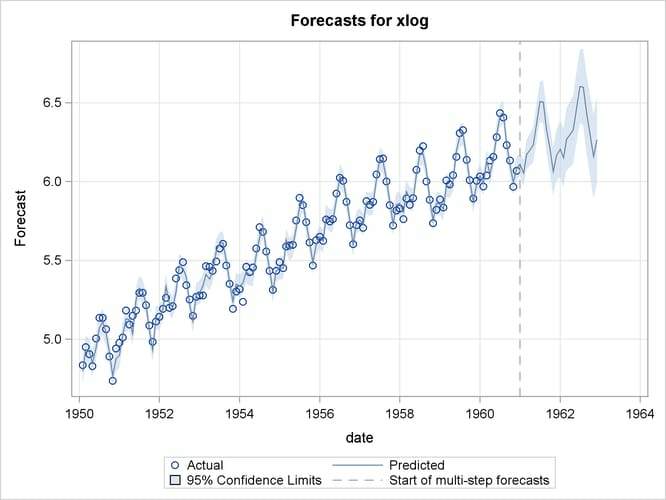 The FORECAST(FORECAST) option produces a plot that shows the one-step-ahead forecasts, as well as the multistep-ahead forecasts; see Figure 7.22. PROC ARIMA assigns a name to each graph it creates by using ODS. You can use these names to reference the graphs when you use ODS. The names are listed in Table 7.13. Cross-correlation plots, either individual or paneled. They are numbered 1, 2, and so on as needed.